Fair and Square is block 18 from issue 19 ‘Art of Quilting’. The name reflects its pleasingly balanced appearance and its adaptability. This block is also known as Diamond in a Square and indeed a variant of the Diamond Square I made here. I found this one a breeze to put together. No inset seams. Just straight lines and simple pieces. In a nut shell, the four white triangles were stitched to the sides of the central daisy diamond. Two orange blossom rectangles are then sewn, one each side. 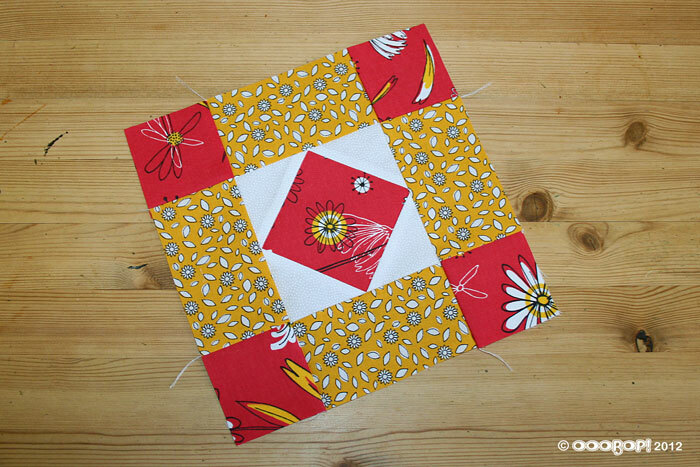 And then two strips are made by sewing a daisy square to each end of the remaining two rectangles, which are then sewn top and bottom to complete the block. I do like the colour combo of this one too. Red and orange and black… all pertaining to my fiery fire-sign no doubt! History: This geometric design and its variations have been found on Amish quilts made in 19th century Pennsylvania. Commonly used as a singular central piece but also as an all-over design. Level: Some experience needed to match seams neatly, otherwise relatively simple. Love the colours. Looks nice and simple apart, of course, from the dreaded points. I don’t know what I do to my points but I’m forever losing them in the seam allowance. Must practise more.